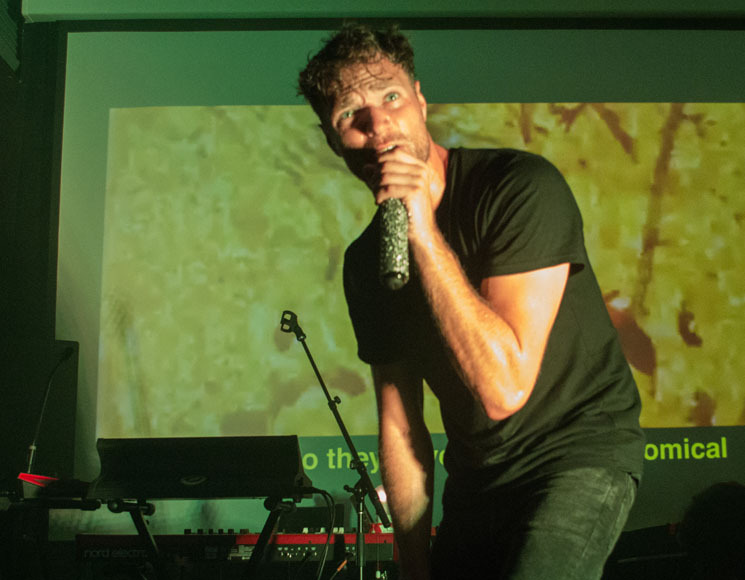 When Rich Aucoin announced his forthcoming Hold EP last month, the news came as a welcome relief. Back in January 2017, the singer/producer, best known for his infectiously upbeat brand of electro-pop, had his car robbed in Costa Rica. Among the stolen belongings was his laptop, containing a good chunk of Hold's material. To bounce back from such a crushing blow would require pure creativity and drive — two things that Aucoin does not lack. Prior to the March 16 arrival of Hold, Aucoin brought his legendary live show to Hamilton's Mills Hardware for a very entertaining Friday night. The experience of a Rich Aucoin show can best be described by the genre definition on his Facebook artist page — "motivational crowd karaoke." Aucoin wasted no time getting up close with the energetic and crowded room, crouching down on the edge of the stage to lead them through a lively shout-along of the 20th Century Fox theme while the accompanying visuals played on a large screen behind him. He and his three-piece band, featuring two drummers (Joel Waddell and Taylor Knox), then tore into a set comprised of both new material and older cuts from his previous two full-lengths. Hold's "Release" proved to be an excellent opener, filling the air with a sense of urgent positivity, while messages of affirmation rolled across the backdrop. "Four More Years," from 2014's Ephemeral, found Aucoin bouncing in the thick of the crowd, illuminating excited faces with the glow of a light bulb that he clutched aside his bedazzled microphone. Before delivering an uplifting performance of "Let It Go," the Nova Scotian quipped about Frozen's massive success with their song by the same name, eliciting laughter from his enthralled audience. The rainbow parachute, a staple of Aucoin's live shows, came out once he and his band dipped into tracks from We're All Dying to Live. "Brian Wilson is A.L.I.V.E." sounded electric, as both Aucoin and crowd enveloped themselves in colour, while the closing performance of "It" was the cherry on top of a dynamic and memorable set. Aucoin's palpable energy and playful interaction with fans created a comfortable intimacy that never waned. The genuine nature of his artistry shines brightest on stage, restoring the vitality of his audience while reinforcing the importance of community and hope.